The Broke and the Bookish : Regarding Jana and "Sea Change"
How I got this book: It was a birthday present. Why I read this book: I’ve got a thing for mermaids these days, and thought this would be a fun one! Sixteen-year-old Miranda Merchant is great at science, and not so great with boys. After major drama with her boyfriend and (now ex) best friend, she's happy to spend the summer on small, mysterious Selkie Island, helping her mother sort out her late grandmother's estate. There, Miranda finds new friends and an island with a mysterious, mystical history, presenting her with facts her logical, scientific mind can't make sense of. She also meets Leo, who challenges everything she thought she knew about boys, friendship… and reality. Is Leo hiding something? Or is he something that she never could have imagined? 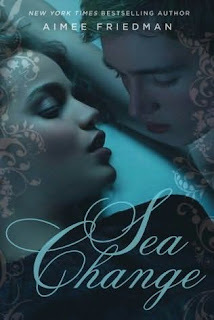 I’ve been a fan of mermaid romance novels ever since I read Beneath a Sapphire Sea by Jessica Bryan . There’s so much an author can do when they are talking about a setting that is so mysterious and unknown to land dwellers like us! That’s why I decided to read Sea Change. It’s not necessarily a mermaid book, but it does deal with mythological themes centered around the ocean. While it was not what I was expecting, I was pleasantly surprised and enjoyed the story. Let me start by saying that the cover is beautiful! It’s even prettier in person than it is on screen because it shimmers! This mystical story of young love lacks a bit in plot, but makes up for it with charm and magic. Miranda is a very likable character because you can relate to her. She’s been hurt by people in her not-so-distant past, and is trying to heal during her summer on Selkie Island. She’s warned on the ferry of mystical water creatures and is told to avoid the native islanders because they are “different.” Right when she arrives, she knows this island is unique. She thinks nothing of it, but begins to understand as she explores her grandmother’s house and the island itself. She’s a bit of an odd man out on the island, which is full of rich and snobby socialites. The first night she’s there, she’s invited to an heiress party (she’s an heiress since she inherited her grandmother’s estate). It’s stuffy, and the “friends” she makes care mostly about money, fashion, and getting in bed with a hot, young, rich, preppy boy. Miranda’s not that kind of girl. She’s a brainy good girl from the big city and has to work to survive. That’s another reason I like her. She’s real. In her quest for getting away from the snobs, she goes to a marine center on the island. There, she meets the mysterious Leo. He’s extremely attractive, and someone Miranda feels she would never have a chance with. He latches on to her, though, and they form a very sweet bond that’s surrounded by mystery and intrigue. They have to sneak around since he’s a native, and the heirs and heiresses of the island shun natives. I really liked Leo. He’s down-to-earth, honest, caring, chivalrous, and sweet. It’s no secret either that he’s a very different kind of person. While the story does not have a complex, fast-paced plot, it is quite intriguing. The reader is given different lessons on mythology and history. You are kept guessing, along with Miranda, until the very end. New facts pop out of the woodwork. Unfortunately, I was still guessing after the book was over. I doubt there will be a sequel, but there certainly is room for one. I would have enjoyed learning more about the mythology that resides on Selkie Island, but perhaps we’re meant to make that up in our own minds. The descriptions of the island and the houses were beautiful and very descriptive. I'd love to visit! My only real complaint was that the story took so long to build up, that the ending was quite rushed. Miranda and Leo’s story went from casual to intense rather quickly. There was plenty of room to slow it down and make it seem more realistic. All in all, though, this was a very sweet book with a lot of southern charm and pure, innocent love. While I read it the week before Thanksgiving, I think it’s the perfect beach read… or the perfect man-it’s-so-cold-outside-I-wish-it-were-summer read if you need to thaw out for a little while! Have a very happy new year and happy reading! I LOVE that cover. And I really enjoyed your review, which made me interested in the book without seeming to give much away. This is definitely on my TBR list! I don't really know how I feel about this one... I didn't really like how you never really knew what he was. Marie, I was going to mention that but was worried I was giving too much away. That kind of bothered me too. Jana, agree with you on this! The pacing (and ending) was a little off for me, but it was still super entertaining. to be honest, this one one of my favorite books of 2010 :) i know the ending is kind of disappointing cause we don't really get a proper closure, but to be that contributed to the overall mythical/magical aspect! i loved this book :) thanks for sharing your thoughts!